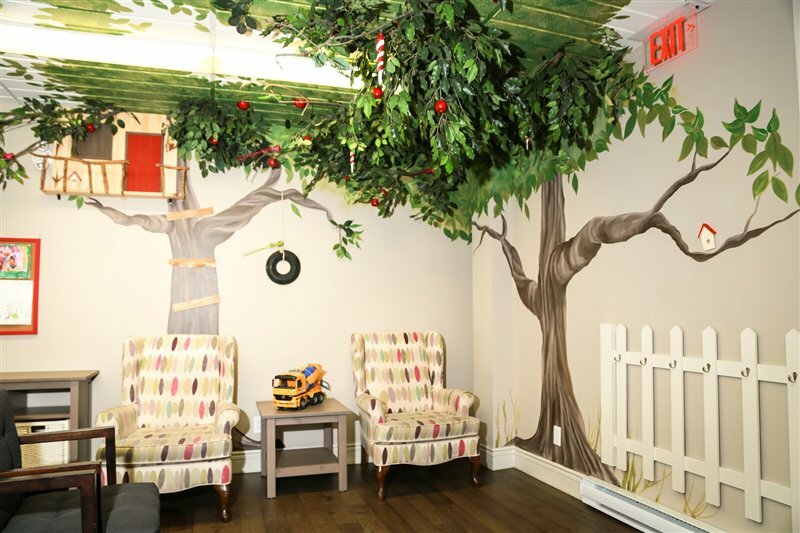 We want to welcome you to our Pediatric Dental Office. Our team is dedicated to making your child feel at ease in our friendly atmosphere. We specialize in treating young children, adolescents and children with special needs. Our three pediatric dental specialists look forward to helping your child achieve optimum oral health. Dr. Sarah Pannozzo completed her dental school training at the University of Toronto. After graduation, she completed a hospital based General Practice Residency at Danbury Hospital affiliated with Yale University in Connecticut. She continued her studies and completed her residency in Paediatric Dentistry at the University of Buffalo. Dr. Peter Pannozzo has over 30 years experience in treating children’s and adolescents’ dental needs in the Hamilton area. He received his Doctor of Dental Surgery and Paediatric Dentistry Specialty Training at the University of Toronto and SickKids Hospital. Dr. Peter has served as the director of the dental program for children with special needs at McMaster University Medical Centre for 20 years, and is also the current Dental Director of the Regional Cleft Lip/Palate Craniofacial Program at Ron Joyce Children’s Center in Hamilton. Dr. John obtained his Doctor of Dental Surgery from the University of Detroit Mercy. Following graduation, he proceeded to complete training in Dental Anesthesiology at Lutheran Medical Center in Brooklyn, New York. He then continued his education by completing specialty training in Paediatric Dentistry at The Mount Sinai Hospital in New York City. Dr. John has been fortunate to be practicing in Hamilton since 2016 and looks forward to serving the community. We look forward to meeting you and your child for your scheduled visit. We make every effort to be on time, but it is important to remember we run on “kid time” and that doesn’t always mean clock time. Every effort will be made to ensure we run on time and we ask that you assist us in this effort by arriving on time for your appointment. In order to provide the best care for your little one, we value our appointment times. If you cannot make your scheduled visit, please let us know 48 hours in advance. Last minute cancellations and missed appointments will be subject to a cancellation fee. Of course, we understand sickness and emergencies do occur and therefore the circumstances for each situation will be considered. We are a fee for service office and full payment is expected at the time the services are rendered. Our staff will assist in processing your insurance claim and when possible filing your claim electronically to ensure rapid reimbursement. The staff will do their best to answer any insurance coverage questions you may have and develop pre-determination of treatment plans when necessary. Please provide us with accurate insurance information on your first visit so we can assist you in the best way possible. Our team will discuss the advantages and disadvantages of tooth coloured restorations in each situation and make recommendations based on the best interest of your child. When the permanent tooth is ready to erupt, the SSC will loosen and fall out similar to a primary tooth. When your child’s tooth has a deep cavity or the tooth has suffered an injury, an infection in the nerve of the tooth can occur. A pulpotomy is a very common procedure in which the infected portion of the nerve is removed and a medicament is placed to preserve the remaining healthy nerve tissue. A pulpectomy is completed when the pulp tissue is irreversibly infected or necrotic (dead). The entire nerve is removed to preserve the tooth. A Stainless steel crown is often the best restoration that can be placed for either procedure to protect the remaining tooth structure. When a primary tooth is lost early due to a cavity or trauma, a space maintainer should be inserted to avoid space loss. If a space maintainer is not inserted, future orthodontic treatment may be necessary. The space maintainer is cemented in place and will be removed when the permanent successor is ready to erupt into the space. If the appliance loosens or dislodges, please notify us immediately and keep the appliance in a safe place for re-cementation. We provide a child friendly environment and always try to make a child feel at ease using behavior management techniques, but sometimes dentistry can be overwhelming for children. 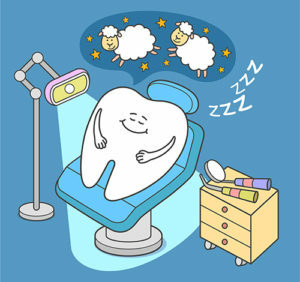 We offer nitrous oxide, oral sedation as well as sleep dentistry. At the time of consultation we will discuss which method is best for your child. When a child feels anxious during dental treatment, they may require more support than a gentle caring manner to feel comfortable. Nitrous oxide/oxygen is a safe and effective technique to calm your child’s anxiety during treatment. Your child will smell a sweet pleasant aroma and will experience a sense of calmness and well-being. One main advantage is that the effects of nitrous are completely reversible and your child can return to school that same day. 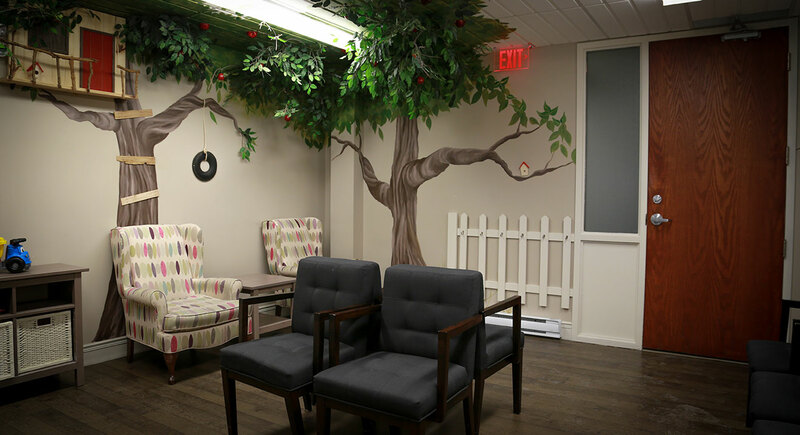 Upon the consultation visit we will determine if nitrous oxide is an option for your child. The preoperative and post operative instructions will be reviewed in detail and recommendations will be made based upon the best interest of your child. General anesthesia involves the use of sedative agents administered by a medical or dental anesthesiologist. Your child will be asleep for the dental procedure. Depending on your child’s age, behaviour, or extensive treatment needs, a general anesthesia may be recommended. The General anesthesia may be performed in a private facility or at McMaster Hospital and at the time of consultation both avenues will be discussed. The goal is to provide a safe environment and a positive experience for your child. ECC is a chronic transmissible infectious disease! What does this mean? It means that certain bacteria in the mouth break down the sugar we eat into acid. Over time this acid breaks down the tooth surface and causes an infection in the tooth. It’s transmissible, meaning that we can actually transfer these bad bacteria to each other! What can you do to reduce your child’s risk? Avoid putting your baby to bed with milk or juice in a bottle. Parents are encouraged to wean infants from the bottle between 12-18 months. Also encourage the child to drink from a cup around their first birthday. Limit sugary snacks and try to have them at meal times. 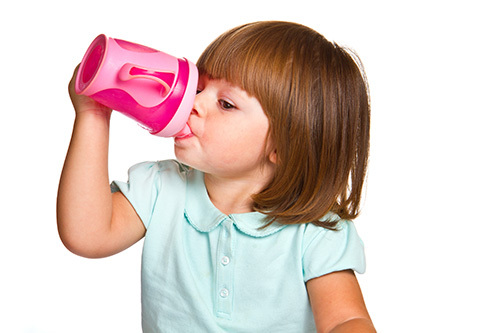 Do not place juices in sippy-cups where the child has access to the sugary drink all day long. Mothers/Caregivers can transmit these harmful bacteria to their child. Make sure moms/caregivers are up-to-date with their oral hygiene as well. Eliminate saliva-sharing activities ie. sharing utensils, orally cleaning pacifiers, even kissing your baby on his/her mouth. Newly erupted teeth are not as strong as adult teeth, so make sure you are brushing your child’s teeth twice a day with a fluoridated tooth paste for children. Visit your Paediatric dentist no later than 12 months of age to establish a dental home! Start early! The earlier a parent starts to wipe the gum pads or brush their child’s teeth, the more familiar the child will become with the daily routine. Not to mention they will have great oral hygiene habits and great dental check-ups! Children need help when brushing, which means parents need to help! As your child grows, they will want to be more independent, so let them brush first, and you follow. 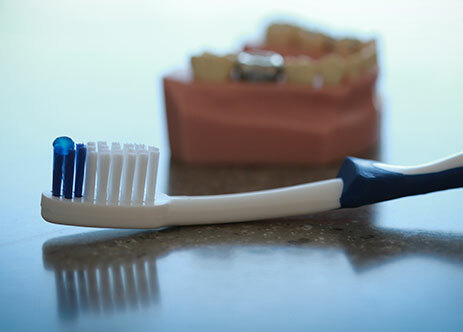 Use a tooth brush with a small head and soft bristles. A smear of fluoridated tooth paste twice a day for children under the age of 2 and a pea size amount for ages 2-5 yrs is recommended. Always supervise your child when brushing their teeth. When spaces between primary teeth close, the spaces are too small for the benefits of the tooth brush and tooth paste. 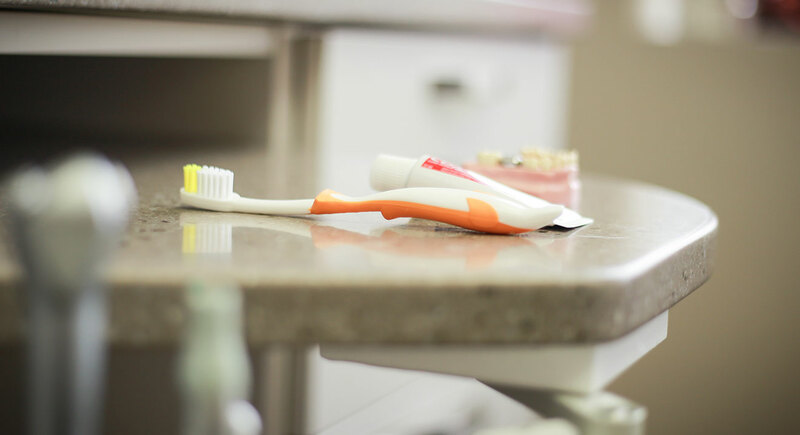 Brushing alone will not prevent cavities from forming. At your consultation or hygiene visit we will discuss the importance of flossing! 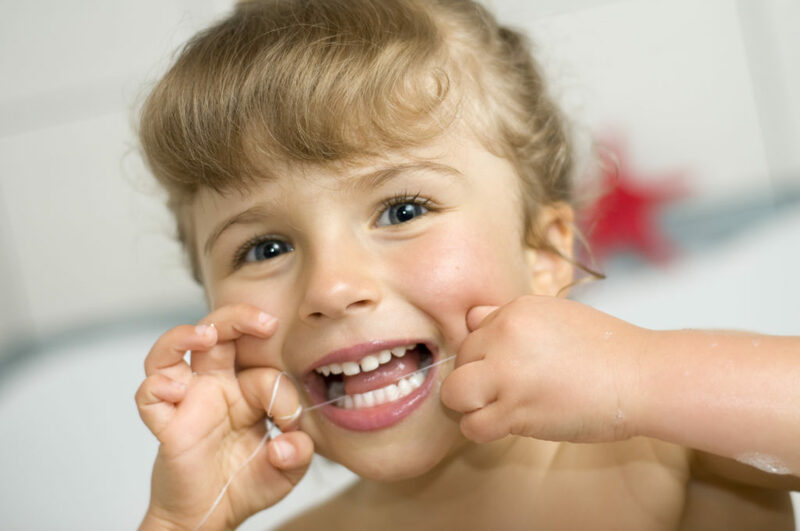 Flossing is critical to prevent cavities that form between your child’s teeth. Fluoride is a safe and effective adjunct in reducing the risk of cavities and reversing enamel demineralization. Professional topical fluoride treatments should be based on caries risk assessment. Children with moderate risk should ideally receive a fluoride treatment every 6 mo. High caries risk children may benefit from a topical application every 3-6 months. Most communities incorporate optimal fluoride levels in the drinking water. If you are in a community without fluoride or are using well-water that has little or no fluoride, systemic fluoride can be achieved through the intake of daily fluoride supplements. BEFORE any supplements are prescribed, it is important to review all dietary sources of fluoride to determine if supplements are necessary or not. Sealant is a material that is flowed into the pits and fissures of the tooth that are susceptible to cavities. Pit and fissure cavities make up 80-90% of all the cavities on permanent molars and 44% on primary molars. As a preventive measure, when your child’s 6 year molars and 12 year molars are fully erupted we may recommend sealants on these teeth. Once sealants are placed they will be routinely checked at every 6 month recall visit to ensure they are intact. 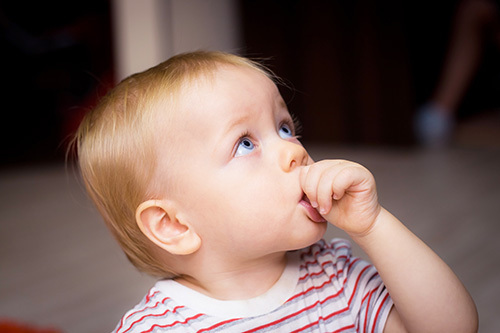 Thumb and pacifier habits are natural for young infants and most habits end on their own. However, if the child continues the habit beyond the age of 3, orthodontic problems may occur in the future. Examples include flared front teeth or a very narrow palate. If you have any concerns, consult your Paediatric dentist. Rewards! Try a calendar! Your child must go the full 30 days without sucking his/her thumb. If this is achieved, they have earned a special reward. Motivate! Show pictures of what teeth can look like after a long standing habit. Try and avoid breaking the habit if there are many stresses in the house hold. Most of all, the child must be ready and willing to stop the habit. 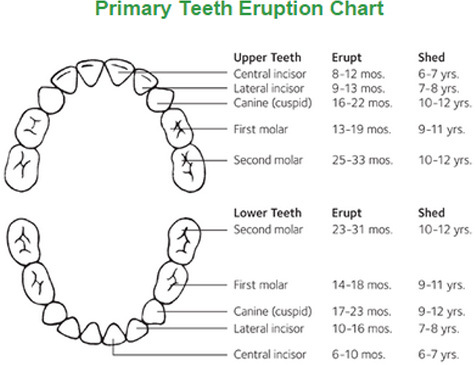 The first primary teeth to expect in the mouth are the two bottom front teeth around 6-10 months of age. Next to follow are usually the upper four front teeth. The primary dentition will be fully present when your child is around 3 years old. Do not be alarmed if some teeth erupt out of sequence, every child is different. Teething can cause on and off discomfort in the area of the erupting tooth. It can also cause irritability and increased saliva. Oral analgesics or a chilled teething ring can help alleviate the discomfort. The use of teething gels or topical anesthetics to relieve discomfort are discouraged due to possible toxicity to your baby. A Paediatric dentist specializes in dentistry for children. They have received two to three years of specialty training after dental school and dedicate their practice to children and adolescence, as well as children with special health care needs. By visiting your pediatric dentist around your child’s first birthday, we are able to educate parents on oral care for their infant as well as inform them of important developmental milestones as their child grows. 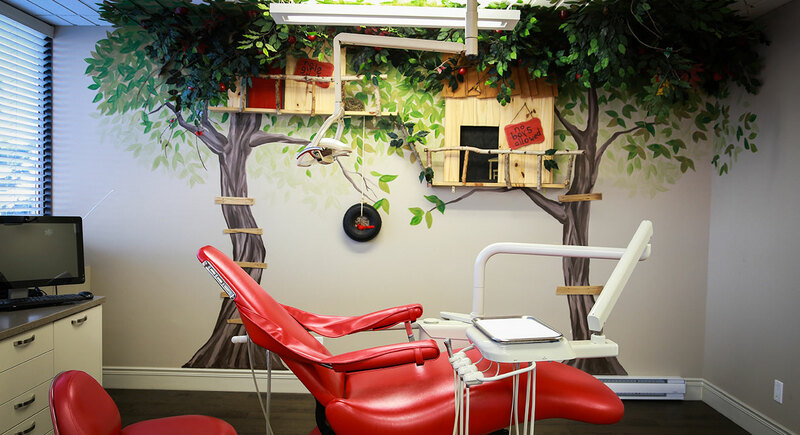 We want to create a dental home where your child will learn about oral health and ways to prevent dental disease. Our goal is to teach your child how to be a great dental patient. 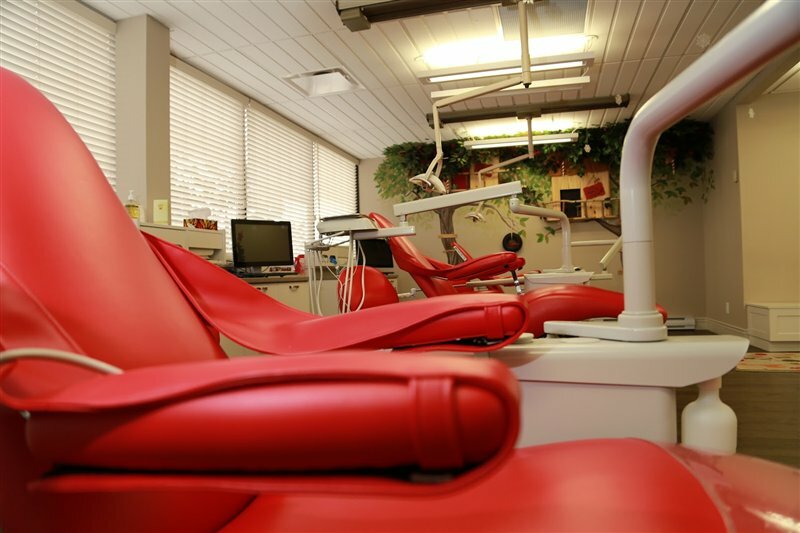 We hope to create enjoyable dental visits which will instill great oral health for a lifetime.